Are you a soccer fan? Prior to the recent World Cup tournament, I certainly wouldn’t have declared myself to be one. When I answered Matt Baumgartner’s call for temporary employees to assist during the tournament, I was responding as a worker, not a soccer fanatic. But, something has definitely changed. This whole soccer thing? I think I like it. Although two of my boys play soccer, I’ve avoided the moniker “soccer mom” with the skill of a teenager ducking household chores. Not me, no way. I attend games and cheer enthusiastically from the sidelines, but I certainly have no interest in driving around in a minivan with a soccer ball decal stuck to the back window. You know me, I’m not much of a joiner or follower. The first match I worked was Team USA vs Portugal. The crowd at Wolff’s Biergarten was tremendous – pumped up and loud, but in no way aggressive or obnoxious. I loved their enthusiasm and the excitement was contagious. This was definitely going to be fun. As “our” team advanced, along with Team Germany, the team of my maternal side of the family, I realized that my soccer playing middle son needed to be part of the scene. I arranged to bring him and a couple of his friends down to check out a match. They were awesome! In a crowd of hundreds, they hung out, clad in red, white and blue, mesmerized by the game and the other spectators. I was impressed by their poise and comfort and knew that Griffin and I would become regulars for the duration of the tournament. As the matches came fast and furious, so did the communication between my family and me – emails, Facebook messages and status updates. 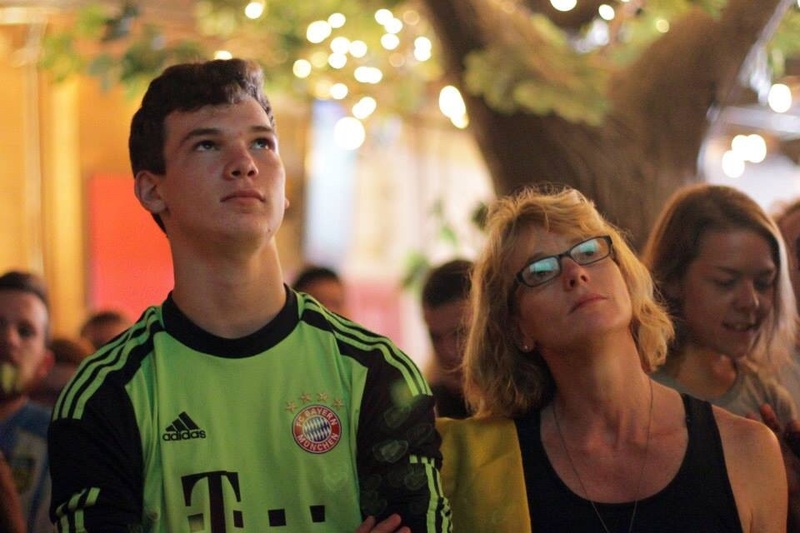 Knowing that my family in Germany were occupied watching the same event as we were, was intensely comforting. Who knew that a ball game could make the world seem so small? I absolutely loved it. When Team USA was eliminated, we placed our energy into cheering on the motherland, Deutschland. Our German flag accompanied us to the subsequent matches and I cherished the opportunity to be proud of being German in a world that doesn’t always perceive us as being worthy of admiration. The hefeweizen flowed and steins were raised amidst shouts of Prost! and Griffin and I hung out, side by side, united in our interest for 90+ minutes. Four years from now, my son will be 19, perhaps not as inclined to hang out in a sports bar with his mom as he was this year. I’d like to think, though, that he’ll someday tell his own children about the times he and I spent together watching the World Cup. If he doesn’t, believe me, I will. More pictures from the tournament here.